Parents have begun to gift their children and teenagers with the latest smart phones these days. This is because not only does the latest trend in technology cause these children to desire such phones but since their safety is important too, both needs combined result in a smart phone being the best choice. Similarly, employers too offer their employees with company owned gadgets and devices which allow easy communication to take place and which ensure that the employee is in touch with the employer as and when needed. Smart phones are truly interesting to make use of but despite the advantages associated with their use, there are certain cons to these phones as well. For instance, with these smart phones come a number of applications for downloading and installation. Without any of these apps, smart phones wouldn’t be as great as they are. Applications are available for a number of things such as for communication, for entertainment, editing, for work purposes etc; you name it and there is an app available for that purpose. However not every app is suitable for every age group which is why even though parents give their children smart phones, they often worry with regard to the kind of apps they may be making use of. For such a purpose, monitoring apps have been designed such as TheOneSpy which has introduced its latest feature for TOS Android app, allowing its users to be able to remotely start or pause an application running on a target phone. This feature of the TOS monitoring app is thus extremely useful as it can come in handy in times of need. 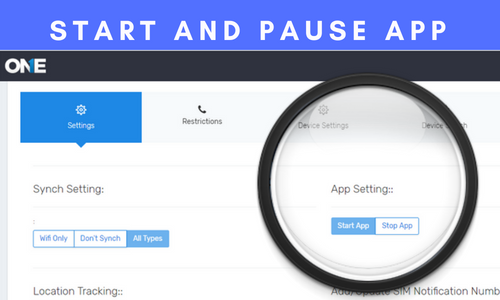 Say you are worried that your child is making use of an application too much and needs to take a break; you can remotely pause the application and prevent it from starting again which will cause your child to eventually take a break or say perhaps your employee is constantly working on something using the app on his phone which is preventing him from doing his work during office hours so you can remotely pause the application he is using so that he may get back to work. This feature of the TOS spying app is truly amazing as it gives the user control over the target phone and ensuring that the phone is used for the right purpose at the right time instead of being constantly engaged in.